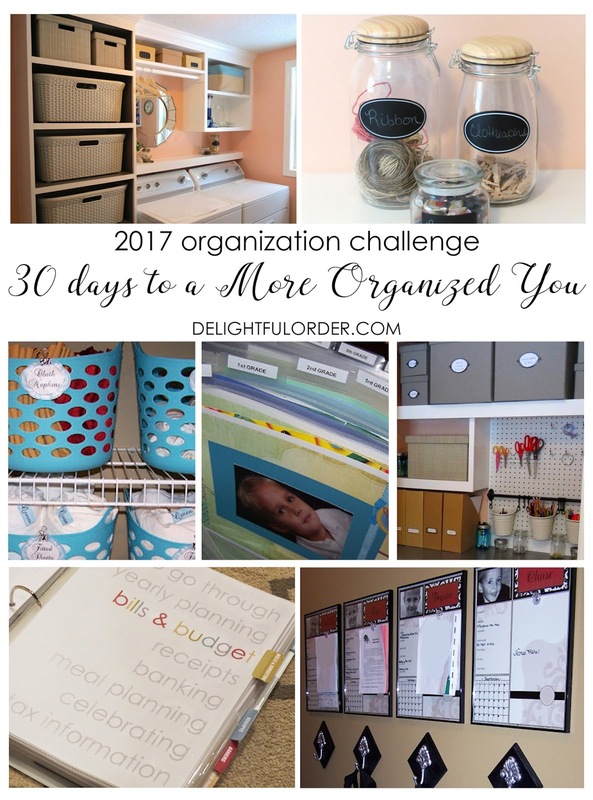 It's January and most people want to get organized in January, so... this month I'm challenging you to a month long organization challenge. We are doing 30 days to a more organized you - A 2017 organization challenge. If you're ready to have a clean and organized home this year, then you'll want to begin this journey with us. Just dedicate a 1/2 hr. to 1 hr. each day, working on each task this month. If one of the daily tasks don't apply to you and your home, simply skip over it. You can choose your own or mix them up a bit, but just dedicate a little bit of time bringing Delightful Order to your home each day. At the end of January, you'll be so happy you did. You may want to have a DONATE box and some GARBAGE BAGS ready to toss items in this month. Our goal is to get rid of some our stuff. Day 1 - get motivated day! today, just print out the “30 days to a more organized you” checklist page and get ready to create a more organized home and life during the month of January! Our daily tasks start tomorrow! If you’re already feeling motivated and you haven’t yet, take down all your Christmas decor today and pack it up until next year. Get rid of any decor that you didn’t use this year, bring it to goodwill or throw it out. Day 2 - papers & bills - I always feel like papers are the very first thing that we need to organize in January. So today, I want you to go around your home and clear those piles of papers. If you don’t have an organized system to your papers/bills, today is the day you create it. I love my all in one planner. I’ve used it for years and for me, this is the best way that I can keep my papers organized. Pay bills, if needed, file, toss or shred papers as needed. If you don’t have an organized system for your manuals, organize those in a file box today too. Day 3 - office desk & office drawers - clear the top of your desk and organize desk drawers today. If you have time, keep organizing your office today. Throw out/sell/donate as much as you can. Day 4 - photo’s & children’s paperwork - take a bit of time today to organize your photos and children’s paperwork. I understand that you won’t be able to get years worth of photo’s organized in one day, but even if you only invest 30 min.-1 hour organizing them, you will be that much more ahead in the photo organizing department. If you don’t have a system for your children's schoolwork and memories and the oodles of papers they come home with daily, today is the day that you create that system. Create an organized box for each child. 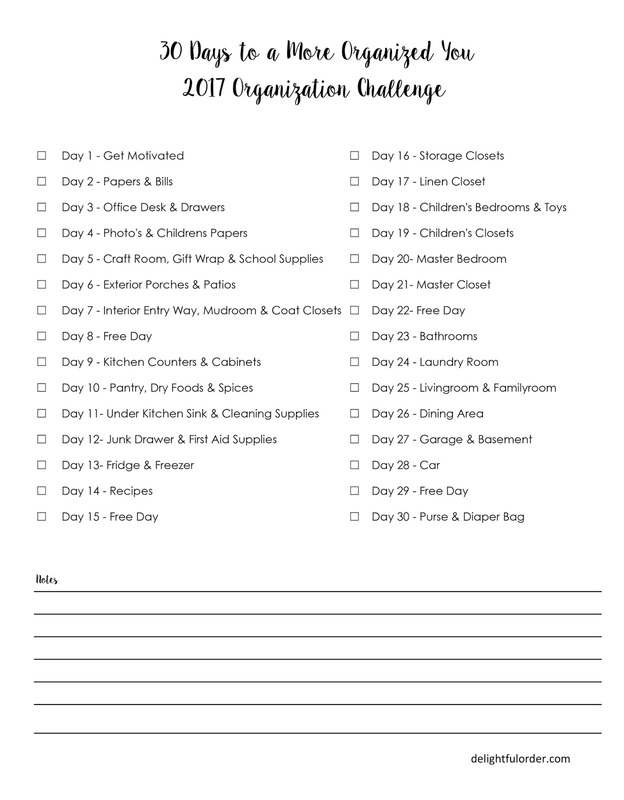 Day 5 - craft room, gift wrap & school supplies - organize your craft room, gift wrapping supplies and school supplies today. Go around your home and collect all craft, gift wrap and school supplies. Lay everything out in piles on your kitchen counter or table, creating piles of like items. Toss broken crayons, colored pencils, old items, etc. If you don’t have a designated spot in your home for all those crafts, gift wrap and school supplies, create that today. Boxes, bins and jars are great for housing a lot of these items. Create a place for everything and then put everything in it’s place. Day 6 - exterior porches & patios - sweep/spray off and clean up your front and back porches and patio’s today. clean cobwebs from corners, light fixtures, etc. create a pretty entrance to your home. hang a wreath on your front door, etc. Day 8 - free day - today is a catch up day or choose your own space to organize today, or... do nothing today. Day 9 - kitchen counters & cabinets - Clear those kitchen counters today. Less is MORE here! Keep very little on the counter tops. It’s amazing how just having the bare minimum on the counter tops can make a kitchen feel clean and organized. Organize a few of your kitchen cabinets today. Get a box/bag and get ready to fill it with items that you will be donating! Take everything out of your cabinets, donate or throw out items that you no longer need or use. Wash the inside and outside of the cabinets and add items back in. Make sure your Tupperware lids have a mate, if they don’t throw them out. Remember, most of us don’t need 5 cookie sheets and 8 spatulas, etc. Get rid of items. Think “less is more” when placing your items back in. Day 10 - pantry, dry foods & spices - today is a BIG day! organize your pantry today. throw out expired foods, place like items together in bins, baskets, jars, containers, etc. Over the door clear shoe organizers are awesome for extra storage in a small pantry. If you don’t have a pantry, how about creating some sort of dry food storage area with shelving in your kitchen? Glass jars filled with flour, sugar, powdered sugar, oats, etc. are so pretty on shelves and on the counters. Organize your spices today too. Use magnetic spice holders on walls, mount spice organizers inside cabinet doors, use step spice organizers inside cabinets, create a drawer specifically for spices. Baskets inside a cabinet is great for holding seasoning packets, etc. Day 11 - under the kitchen sink & cleaning supplies - take everything out, wipe down and place items back in. Dollar Tree baskets are awesome under the kitchen sink. Over the door clear shoe organizers are a great way to organize cleaning supplies inside a closet. Day 12 - junk drawer & first aid supplies - just about every home has a junk drawer (or two) if you have more than one, take today to consolidate it down to one. remove everything, wipe down and place items back in. use drawer organizers to keep things in order. Organize all your first aid supplies today too. Create an organized medicine cabinet, if desired. Again, I use Dollar Tree bins to organize all of my first aid supplies. Day 13 - fridge & freezer - First things first here... remove everything from the front of your fridge/freezer doors. All those notes, photo’s, reminders, magnets (and everything else you keep on the front of your fridge) take it all off. Today, I recommend finding a different spot for all of those items. If you can, keep nothing on the front of your fridge door. It makes for a much cleaner looking kitchen. Use the side of your fridge (But keep it organized looking) or take an old frame, add chicken wire or ribbon to it and keep everything on that with mini clothespins. Remove everything from the inside of the fridge and freezer. Throw out the old. Wipe it down and place everything back in in an orderly manner. Bins, baskets, jars, fridge organizers are great organization for the fridge and freezer. Day 14 - recipes - Let’s organize all of our recipes today. Create an organized area for all your recipes. Either dedicate a cupboard or basket or some place to keep all your recipes in one place. Go through your recipe books, getting rid of any that you no longer need or use. Magazine file boxes are an awesome way to keep a lot of your recipe books organized and looking nice and uniform. Create a 3 ring binder for “favorite recipes” and another for “recipes to try.” Create an organized recipe box with all your favorite recipes. I do all of the above. Day 15 - free day - today is a catch up day or choose your own space to organize today, or... do nothing today. Day 16 - storage closets - organize all your storage closets today except the linen closet, the linen closet is our task for tomorrow. Go through, organize and purge extra clothing. Store them in large plastic totes/bins (sort clothing by sizes.) If you have decor that you plan on using, how about hanging it up today or choosing to get rid of it, instead of continuing to store it. OR... Create a bin or a specific shelf for decorations that you aren’t currently using, but you don’t want to get rid of. If you’d like, create a work in progress bin for those projects that you’re working on. Day 17 - linen closet - remove everything from your linen closet. Donate or toss out items you no longer need or use. Wipe down and vacuum the floor. Fold items and place items back in an orderly fashion. Dollar Tree baskets are great for organizing linen closets too. Day 18 - children’s bedrooms & toy organization - wash all your children’s bedding today, make beds, pick up floors. Go through and organize all the toys in your home. Donate or toss any toys and items that you no longer need. When organizing toys, place like items in basket or bins. Day 19 - children’s closets - organize the children’s closets today. Donate or toss any clothing or shoes that are no longer needed. Day 20 - master bedroom - take some time today to clean the master bedroom. wash bedding, make the bed, clean under the bed, put clothes away in their proper place, organize dresser drawers and the night stands, dust and vacuum. All too often the master bedroom is the last room in the home that gets attention. However, the master bedroom should be a place of relaxation, not the place where anything and everything gets dumped. Keep the stress out of the master bedroom. Create a relaxing atmosphere. Add some potpourri or some candles to the space, if you’d like. Day 21 - master closet - Organize the master closet to the best of your ability today. Donate or toss clothing and shoes that you no longer need or wear. Keep a basket labeled ‘donate’ in your closet and throughout the year, as you notice that something isn’t being used or you’re no longer wanting it, throw it in your donate basket... Donate the items as your basket fills up. Color code your hanging clothes to create a more organized look. Use baskets on shelves for shorts, pants, workout clothes, etc. Use a scarf organizer or a simple hanger to hang your scarves. Use a hanger to hang extra bags. If you store winter clothes in the summer months and summer clothes in the winter months, use totes that fit on your top shelf for the off season clothing and label the totes. Invest in shoe organizers to keep your shoes organized. Day 22 - free day - today is a catch up day or choose your own space to organize today, or... do nothing today. Day 23 - bathrooms - organize and clean your bathrooms today. Wash the rugs, remove items from the cabinets and wipe the insides of the cabinets. toss out anything that you can and place items back in. I suggest storing toilet paper in bathroom cabinets. Simply divide the toilet paper between all bathroom cabinets. Dollar tree baskets are amazing in bathroom cabinets. If you have time, organize your makeup and jewelry today too. Day 24 - laundry room - Let’s get all the laundry caught up today. wash, dry, fold and put it all away. Do a quick clean up of the entire space. Wipe down the counters, the floor and the washer and dryer too. Clean the cabinets today too. Throw out items as needed. Day 25 - living room & family room - go through and tidy up these rooms today. Clean, organize and dust the side tables, coffee tables, shelves, etc. Discard old magazines. Organize books, games, cd’s/dvd’s, etc. Donate or toss items no longer needed. Be sure to check under the couches and the cushions too. Vacuum these rooms today too. A large basket next to a couch is perfect for storing extra blankets. Day 26 - dining area - clear the clutter off the table. By now, your home should have a place for everything, so there’s no reason why the dining table should be stacked with items. Just remember... put everything into it's proper place. If something doesn’t have a proper place, today is the day to create that. You have to keep telling yourself “A PLACE FOR EVERYTHING AND EVERYTHING IN IT’S PLACE.” Once the table is clean, wipe it down with hot soapy water. Vacuum and mop the floor. Day 27 - garage & basement - do as much as you can to organize and clean the garage and or basement today. If it’s all too overwhelming to you, simply set a timer for 30 minutes and do as much as you can in those 30 minutes. A little organization is better than none at all. Day 28 - car - clean and organize your car today. wipe down the interior, vacuum and wash the windows. clean and organize the glove box too. Day 29 - free day - today is a catch up day or choose your own space to organize today, or... do nothing today. Day 30 - purse & diaper bag - go through and organize your purse and diaper bag today. throw out garbage, take care of receipts, etc. small zipper pouches are perfect for organizing like items together in purses and diaper bags. So there's the list. To make it easier to remember everything, I've created a FREE printable for you to print out. Simply check off the items as you finish them. This is going to be very difficult for me. I'm an awful organizer. I just move stuff around, not knowing where to put anything.